Thank you for joining us for the Animal Magic Challenge and we hope you will all join us again this week too. We are showcasing Lindy’s Gang Products this week. You don’t have to use them to join in but if you have some we would love to see them used. The lovely people at Lindy’s Gang sent all of the DT a parcel of samples to use, thank you so much, we really appreciate them! I love Lindy’s Gang products. I received the Mermaid Seashells Magical set. Gorgeous watercolour pigments in cute jars. Love the intensity of the colours and shimmer in them. Thanks you so much for the lovely products. Appreciate your generosity. This is my first time using such pigments and had great fun with it. I made couple of cards using them. 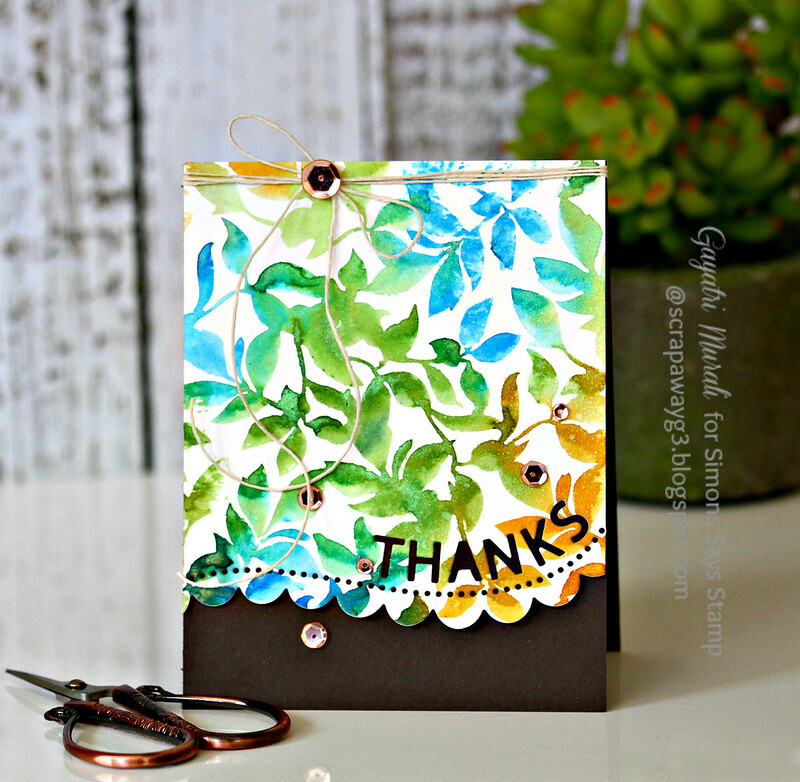 For both my cards, I used Simon Says Stamp Leaves cling background stamp. I put a pinch of the powders from the Mermaid Seashells Magical set on my watercolour palette and added few drops of water to make a viscous paste so I was able to brush the colours using watercolour brush on to the leaves background stamp. I used Azure Sea Asters, Cocklebells Corall, Glory of the Sea Gold and Sea Mint Green pigments. I randomly applied the colours and blended them. Since I was using them for the first time, I was slow in applying. The colours dried on me but I was able to bring them back by spritzing water on them as they are watercolours. I stamped on Strathmore watercolour paper. Wow! That was gorgeous to see the colours with shimmer. There was enough pigment on the stamp that I spritzed water on it to stamp on another watercolour paper. The impression was softer than the first which you can see on my second card. I thihnk if you like a softer look, you can go for another impression. There is enought pigment to get three images with just one application. I also sprayed clear shimmer on the both the panels to get extra shine on them. 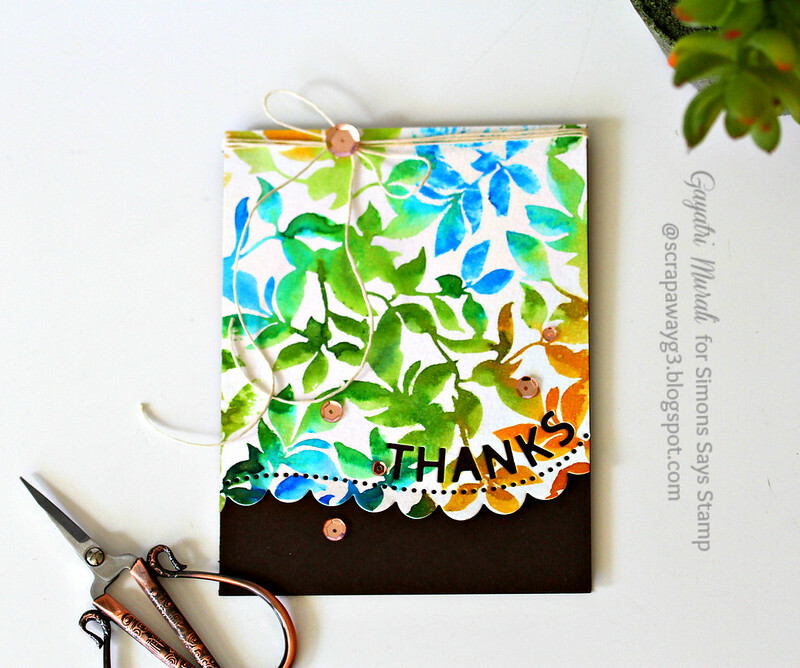 Once dry, I die cut the panels using Thanks Scallop border die from Simon Says Stamp. I die cut one panel horizontally and the other vertically. Since the border die has the sentiment already diecut on them, I didn’t feel the need to add more sentiment. You could add a secondary sentiment if you like. 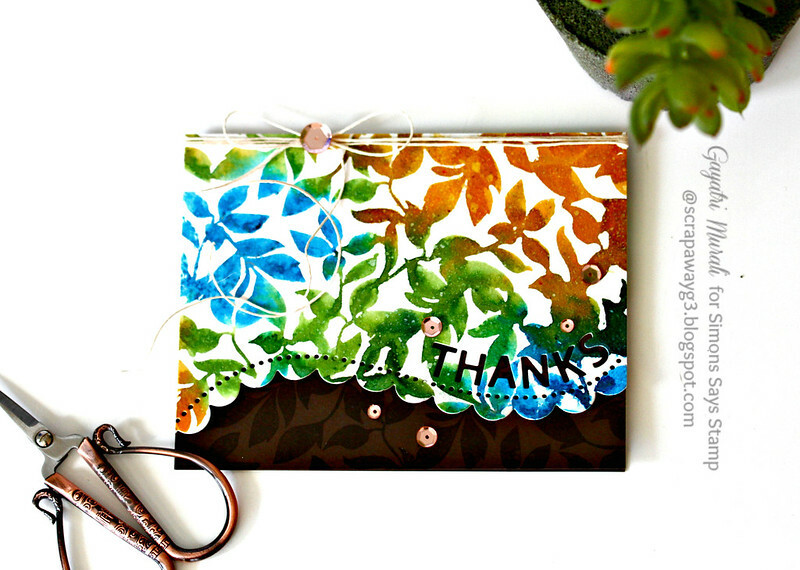 For my horizontal card, I stamped the same leaves stamp using Simon Says Stamp embossing ink to get tone on tone background on the brown card base. I adhered the stamped die cut panel on the top of the card base, used natural twine to tie a bow and embelished with Rose Gold sequins. For my second card, I used the the vertical stamped and die cut panel. You can see he colours are much softer than the previous card. This is second generation stamping. I love this because you can see some areas with intense colour and fading to the soft. Love that effect which also adds to the texture of the panel. I actually made this card first. So I adhered the panel on the brown card base. After adhering I felt the base below the stamped panel felt a bit plain. 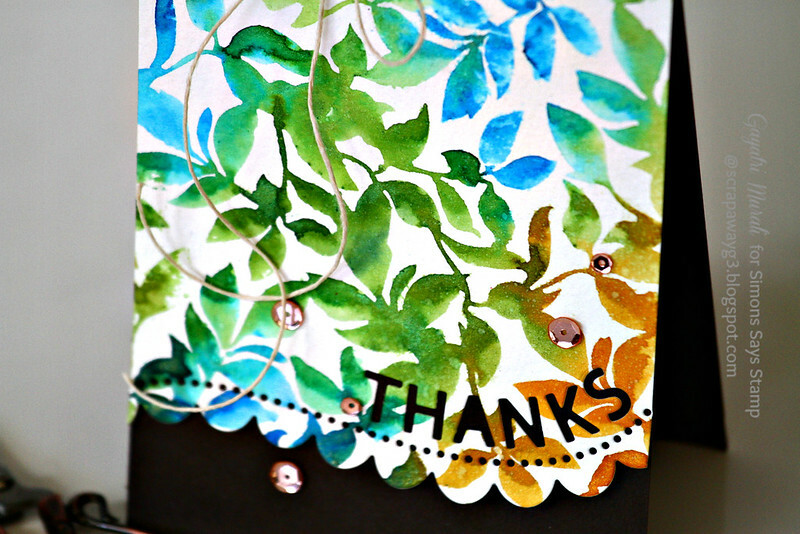 That is the reason I stamped the Leaves image with embossing ink to get the tone on tone effect for the previous card. Just a variation. I like both though. I did exactly the same for this card as well. Used the natural twine to tie a bow on top of the card front and embellished with Rose gold sequins from Pretty Pink Posh. Love how these turned out, Gayatri! I love these colors with the chocolate brown! great card! very well done! stunning Gayatri. I have some sprays by Lindy which are super glimmery so will have to give them a go. Wonderful design! And the color is gorgeous! I wasn't familiar with Lindy's Stamp Gang, but I am now. The Mermaid Seashells Magicals Set is now on my wish list! 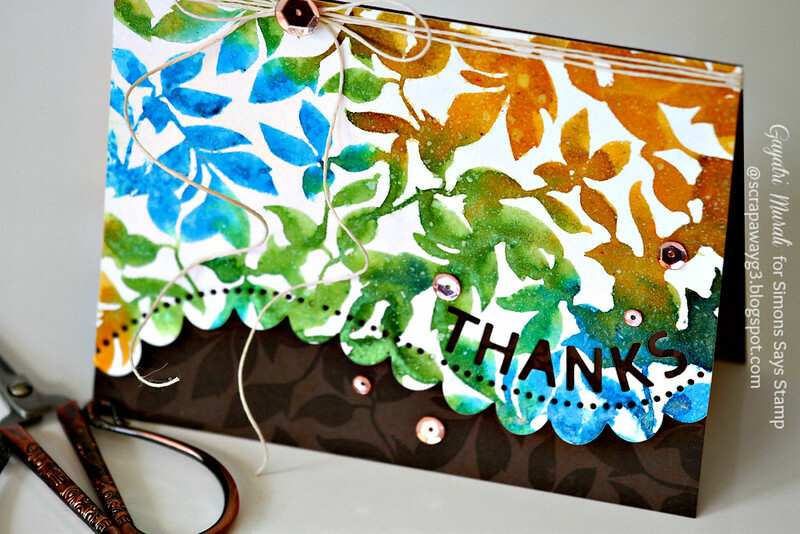 Lovely combination of colors, Gayatri! Wow! A beautiful card Gayatri, I am here at last with Lols healping out with my card aat last. 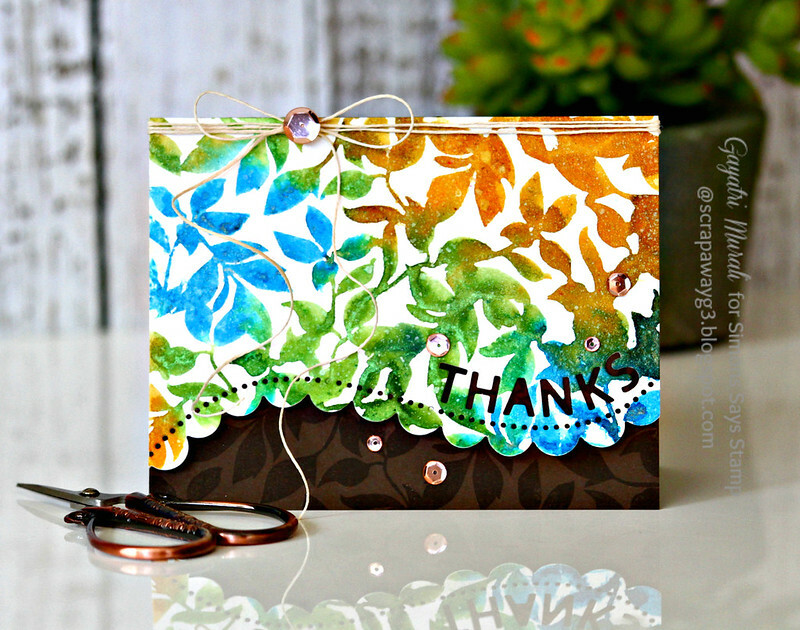 Your card is gorgeous along with beautiful stamping with super colouring with super colouring ! !